For example, you may have dozens of sites hosted on a drupal 6.18 codebase. But suddenly the 6.19 release comes out with vital security fixes. Previously you'd have to go to each site, back up the files and database, upload the new codebase, run update.php, check everything worked and then onto the next site. The "Site migration" feature is enable by default. So you don't have to enable it. Domain name (this is already the domain of the existing site. If you are intending to simply rename the site (give it a new URL altogether), you can simply change this field and leave the target platform be the 'current platform'. This will make the site accessible under the new URL. Platform selection. A radio selection of available platforms on the Aegir system. Certain platforms will be un-selectable. This is because they contain 'Errors' - that is, they contain versions of packages (modules, libraries or themes) that are of an older version than that of the original platform. You cannot upgrade a site to older versions of the same package. 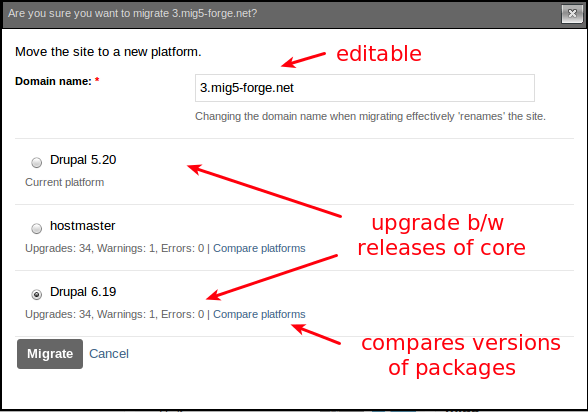 The Migrate task, despite its name, is the tool for upgrading your site, because the Migrate code actually invokes the command drush updatedb in the backend, automatically. drush updatedb is the equivalent of running '/update.php' in your browser against your site.